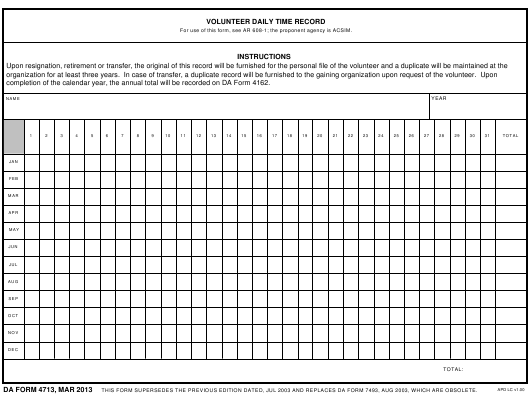 DA Form 4713 - also known as the "Volunteer Daily Time Record" - is a United States Military form issued by the Department of the Army. The form - often mistakenly referred to as the DD form 4713 - was last revised on March 1, 2013. Download an up-to-date fillable PDF version of the DA 4713 down below or look it up on the Army Publishing Directorate website. For use of this form, see AR 608-1; the proponent agency is ACSIM. completion of the calendar year, the annual total will be recorded on DA Form 4162. THIS FORM SUPERSEDES THE PREVIOUS EDITION DATED, JUL 2003 AND REPLACES DA FORM 7493, AUG 2003, WHICH ARE OBSOLETE.